Employers need much more than just raw data to operate a successful employment screening program. As one of the world’s largest providers of employee background check services, HireRight specializes in helping organizations of all sizes and locations efficiently implement, manage and control their background screening programs. HireRight developed the industry’s first Internet-based background screening solution and launched it in June 1997. HireRight was the first to develop pre-integrated background screening solutions with leading e-recruiting applications, and now offers more of these solutions than any provider in the industry. 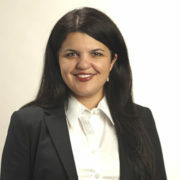 In 1997, Rachel Trindade completed a Bachelor of Business Administration in Marketing at University of Texas at Austin. Rachel was Market Segment Manager at MGE UPS Systems, and Corporate Communications Manager / Client Services Group Manager at PFSweb. Rachel served as Director of Field Operations and Senior Director of Global Market Development for Altegrity. Today, Rachel is Vice President of Marketing: Strategic Go to Market executive driving brand awareness and revenue growth for HireRight.